To share water-safety topics with citizens. To build additional activities at Ammon Pool in August 2018. To better utilize certain sections of the large swim pool are not busy in afternoons and evenings in August. To blend in SKWIM and water polo with pool patrons in an organized setting. To pilot a SKWIM house league for possible expansion in future years at other Citiparks pools. 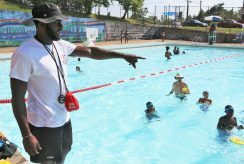 To promote fun, competitive events that can improve swimming skills and endurance so more kids can one day become lifeguards. To stress sportsmanship, new friendships, inter-generational play among various groups. To make up for a lack of student-swim opportunities in 2018’s Summer Dreamers Academy. To provide athletes of various sports a cool-temperate fitness setting during August’s summer-time heat. To generate additional gate receipts for sustaining Citiparks pool operations. To provide swimmers, triathletes and lap-swimmers game-time experiences so they may one day turn into water polo players and eventually join the Pittsburgh Renegades Water Polo Team. To give suburban visitors another reason to visit Pittsburgh’s Hill District besides for a Penguins game or concert at PPG Paints Arena. Insert additional reasons in the comments below. Let’s fight fear and bust this falsehood.